IS IT (VERY) LATE NOVEMBER ALREADY. Look! The days of the week for February of this year are the same days for March of this year! As in, February 1 is a Tuesday, and March 1 is also a Tuesday. And February 14 is a Monday, and March 14 is also a Monday! February 25 is a Friday, and March 25 is also a… Well, you get the point. Or, am I just really shallow and I’m the only one who thinks this is something to be happy about? Whatever. It’s the first time in my lifetime that this has happened (that I noticed). Yesterday, I traveled basically from one end of Metro Manila to the other, and even went so far as to reach its outskirts. But I had fun anyway so it was completely worth it. 🙂 Anyway, here’s the story. Here’s something strange about the Philippines. Artists (except those in showbiz) don’t get paid very well. And when I say artists, I’m including writers. Even the good ones. I mean, unless you’re of National Artist status, chances are, what you earn from your works is very little. I guess a good thing about this is that it keeps you grounded. The bad thing is that you can’t do what you love full time and you need to have other sources of income. But I digress. I really want to tell you that yesterday, while in the jeepney on my way to UP Diliman, I sat next to somebody famous. Guess who? DH! (Haha, I’m not spelling out his name. Iwas Google, baka mabasa niya ito at sabihin ang stalker ko!) Who is DH? He’s a somewhat famous local author. OK, he’s not that famous (unfortunately), but he’s a Palanca winner and one of my favorites. His works are mostly sci-fi/thriller/fantasy and his publisher is the same publisher of Zsa Zsa Zaturnnah and the Kikomachine series. Anyway, I think he’s a really really good writer and basically, I would kill to have an imagination like his. Haha! So, I’ve been going to the Komikon since it started in 2005. Although I’ve been attending less and less events every year, and have been staying for a shorter period of time. Yesterday for example, I was only at the Komikon for a total of… 1 hour. And I spent about 15 minutes of that hour in the girls’ restroom, wiping off sweat from my face because this year’s summer is just so hot! But yeah, I was there for only a short period of time. Why? Because spending more time in there would’ve made me bankrupt, that’s why! I swear, going to the Komikon is one of those events where you lose your money real fast! And although it’s in exchange of good comic books, it still makes me a little sad when I realize that after only an hour, my wallet is already empty, save for the money that I would need to get home. And here I thought I was prepared for it this year, unlike the last time. I guess I was wrong. But although I only stayed for an hour, I got what I came there for — Manix Abrera’s 12, and Elbert Or’s Lola: A Ghost Story. And I got them both autographed. 😀 So I don’t think I wasted my time, going all the way to UP Diliman from my house in Las Piñas, only to stay for less than the time I traveled to get there. No pictures though. I brought my camera but completely forgot to take pictures. But actually, I still feel a bit awkward asking for pictures. I mean, I know the artists are nice and all that, but somehow I feel like I’m being too much of a nuisance if I ask for a picture. I mean, they’re already signing autographs for you and you ask for more? So another reason I stayed at the Komikon for only an hour is because I actually had another place to go to yesterday. I was going to visit my godson and his mom (my very good friend X). And since they lived in San Pedro, Laguna, I knew had to leave Quezon City early, if I was going to make it to their place during the daytime (haha). 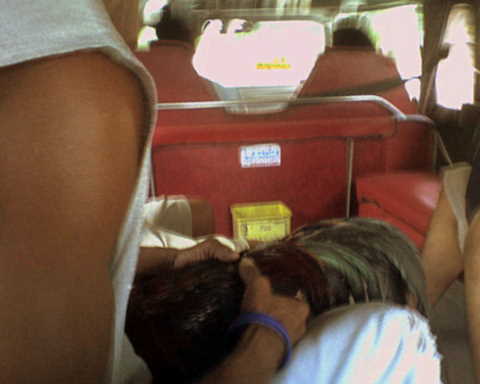 Man with rooster, sitting beside me in the jeepney. 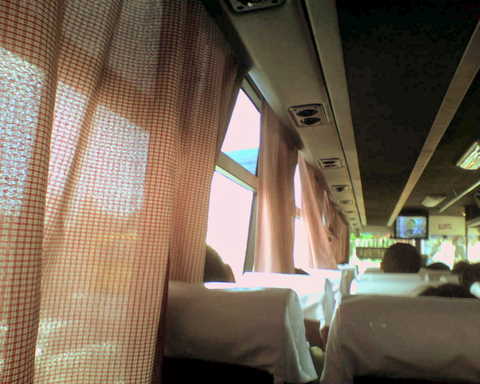 Bus curtains are the same pattern/cloth as my high school uniform. Unfortunately, I wasn’t able to take a picture of the car crash that caused us delay. But who wants to see another car crash, anyway? I’ve run out of words now so I’ll just let the pictures tell you the story. 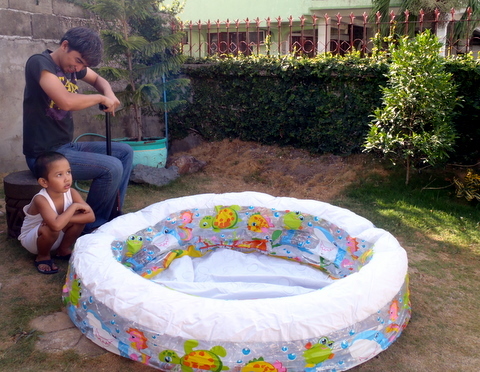 A, impatiently waiting for the pool to get inflated. 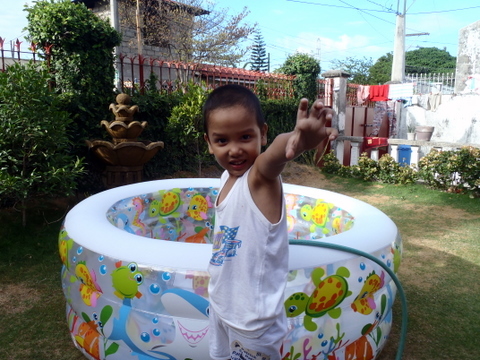 E, trying his best to inflate said pool. We interrupt the love quotes posting for this, er… random thought. Comic convention in UPLB tomorrow. I was thinking of going but then thought about how far it is from my house and then decided to just go to the comic convention this summer in UP Diliman. And then I realized that UP Diliman is just as far from my house as UPLB. Not kidding. They’re both around 42 kilometers away, and within walking distance from really good cake — UPLB: Mer-Nel’s, UP Diliman: Chocolate Kiss. So, yeah… It’s a dilemma. Hehehe!